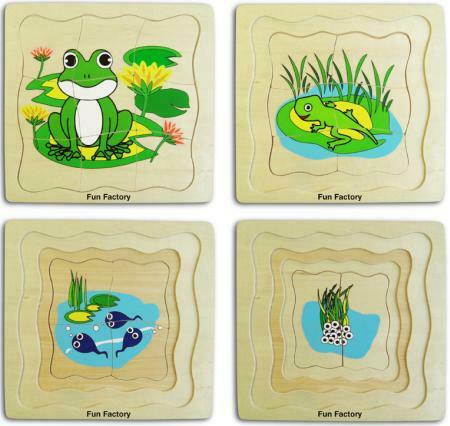 Wooden Tadpole Frog Layer Puzzle is a clever challenging toy that illustrates the life cycle of a frog. With twenty one pieces in four layers of two, four, six and nine pieces this is a great educational toy. Each layer builds upon the last from Spawn to Tadpole to Froglet to Frog. This is a deceptively difficult puzzle and a fantastic way to learn about the world around us. We like this because: "Really clever puzzle very popular with boys and girls."